Items that you pay for after a battle you use it. You do not have to pay for a single use item after a battle if you did not use it. These items repair modules, extinguish fires, and heal crew members. The Fire Extinguisher is a single-use item that you can use to extinguish a fire in your tank. It costs 500 credits at Tier 1 and the cost increases by 150 each tier. The First Aid Kit is a single-use item that you can use to heal all crew members. It costs 500 credits at Tier 1 and the cost increases by 150 each tier. The Repair Kit is a single-use item that you can use to repair all broken or damaged modules. It costs 500 credits at Tier 1 and the cost increases by 150 each tier. The Engine Boost is a single-use item that you can use to boost your engine power by 30% for 30 seconds. It costs 500 credits at Tier 1 and increases by 150 each tier. Adrenaline is a single-use item that, when used, increases loading speed by 25% and gives a +10% chance of damaging enemy modules. It is only available to the MS-1 at tier 1 and it costs 1400 credits. It increases by 700 credits each tier. 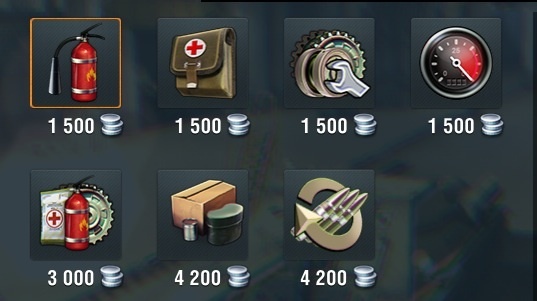 Items that you pay for after every battle even if you don't use it. The Multi-Purpose Restoration Pack is a multi-use item that you can use to extinguish fires, heal crew members, and repair broken/damaged modules all at once. It then has a 60 second cool down where you can use it again later in the battle. It costs 1000 credits at Tier 1 and increases by 500 each tier. Items that you pay for after every battle, but give you an buff throughout the whole battle, similar to Equipment. These items are all the same, they just have different names and images. They give a 10% boost to all crew skills throughout the entire battle. It costs 1400 credits at Tier 1 and increases by 700 each tier. There are right times and wrong times to use consumables, hopefully this helps you manage your credits while still doing maximum damage and surviving as long as possible! When you buy a new tank, you may find yourself strapped for credits. Therefore, don't use consumables until you can at do enough damage per game to earn enough credits to repair any damage and have plenty left over for consumables. Also, don't jump right into the expensive consumables, just use the essentials, and eventually you will be able to move up to the more expensive consumables. Consumables are very situational, which is why you should pick the consumables that will help in every situation. Obviously the basic Fire Extinguisher, Repair Kit, and First Aid Kit is the cheapest and safest way to go, but if you want to deal more damage while still keeping your tracks intact, you should try an edgier approach. If you are a medium, try using the engine boost, multi-purpose restoration kit, and a repair kit, because getting tracked as a medium is one of the worst things that can happen when you are zooming around, due to a medium's low armor. For a heavy, your rate of fire is pretty slow, but not super slow. For heavies, try a multi-purpose restoration kit, combat rations/cola/chocolate, and a repair kit, because it getting tracked while facing off against tanks 2 tiers higher than you is no way to go! This way, you get sort of a overall boost while still feeling that you can play it safe and not spend too many credits. Now, for tank destroyers, you have an extremely long reload time, and that puts you in a pickle when you are caught in the open, so I recommend adrenaline to get that rate of fire up, a multi-purpose restoration kit, and since you will be doing lots of damage as a TD, try combat rations/cola/chocolate for a while and see if it drains too many credits. If it does, just slap on a repair kit.